Paul Ecklund receiving the Corrie Bair Building Inclusive Communities Award from RoAnne Chaney, Executive Director of MDRC. 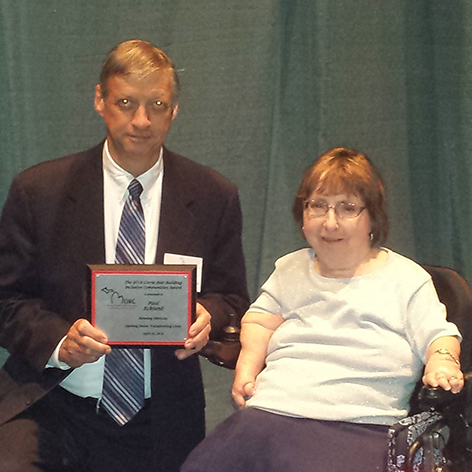 Disability Network Southwest Michigan is proud to announce that one of our staff members, Paul Ecklund, was named this year’s Corrie Bair Building Inclusive Communities Award winner at the Building Michigan Communities Conference which took place in Lansing on April 25 & 26. The Corrie Bair Building Inclusive Communities Award is granted to an individual working to make communities and housing accessible to all. 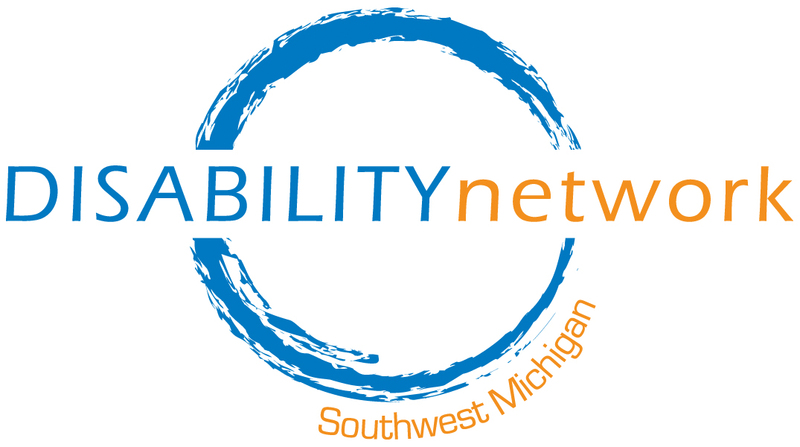 Paul is a Disability Rights Advocate at Disability Network Southwest Michigan and is active in the Kalamazoo County Transportation Authority, Kalamazoo Coalition for Excellence in Mental Health and the Kalamazoo Continuum of Care. Through the continuum, Paul has worked to build more affordable and accessible units to help end homelessness, spreading the word on Frequent Users Systems Engagement (FUSE) to coordinate services and decrease the costs to communities. Paul also helped with the successful campaign to pass the Kalamazoo County Local Housing Assistance Fund Millage. Paul began his career in environmental science and experiential education and then became a clinical psychologist. Since 2003, Paul has been a tireless advocate for inclusive housing for people with disabilities. Paul is a nationally certified ADA Coordinator, serves on ADA Michigan and has led the Michigan Disability Housing Work Group, a cross-disability coalition focused on Affordable Housing and Inclusive Communities, for more than a decade. Under Paul’s leadership, the work group has advocated for improved housing policy changes at the local, state, and national level. Paul has a unique ability to explain the concepts of universal design and accessibility to diverse audiences, including builders, architects, planners, advocates and everyday citizens. Paul is a relationship builder, highly respected by parties on all sides of debates and decision making. Paul understands and works for the big picture and the long haul, never wavering in integrity and principle while building coalitions. Paul spearheaded efforts to collaborate with the National Low Income Housing Coalition (NLIHC) on their United for Homes Campaign to secure funding for the National Housing Trust Fund and which will be sending monies to the states, including Michigan, this summer. Paul also worked with MSHDA and Rep. Lorence Wenke to pass the Inclusive Home Design Act, PA 182 of 2006 to make one to four unit homes built with MSHDA loans at least visit-able and has advocated every year for improvements to the QAP (Qualified Allocation Plan) to increase accessibility. Paul is relentless in his efforts and at the same time he is kind and strategic. He looks for opportunities to educate and improve access. He is deeply respected by colleagues and people in the community. We are honored to present him with the Corrie Bair Award for Building Inclusive Communities recognizing more than a decade of effort and outcomes that benefit all people.